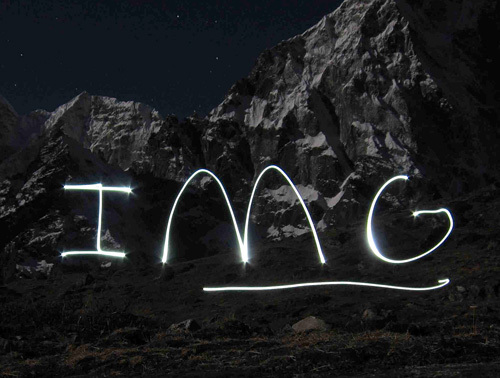 With so many options for Kilimanjaro trips, why should I choose IMG? You're right; there are a lot of operators in the Kilimanjaro business these days and most got in fairly recently. We encourage you to do your homework and make the decision carefully. 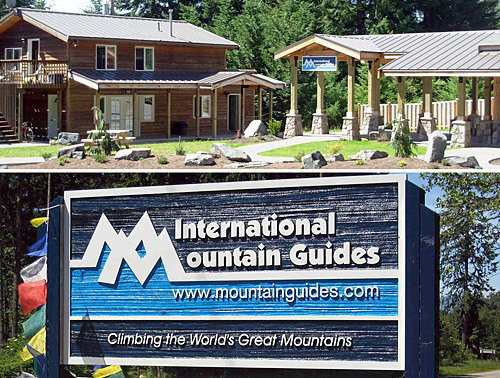 IMG's partners started in the guiding business in the 1970's. Their first Kilimanjaro trip was conducted in 1989. And to this day, we're proud to say we've still never had a group (as a whole) not summit, and we've still never had a serious injury accident. IMG partners Eric Simonson and Phil Ershler personally oversee each program. They are supported by a dedicated team in the IMG office that provides personal attention to each client. You won't find a better customer experience before, on and after your trek. Though, the pre-trip attention is great, most important is who is running the show, and who is responsible should problems arise. Of course we work with the local hotels and guides, but they do NOT operate our programs. Unlike many travel companies that are just retailing the services of local sub-contractors  and who then in the fine print of their release documents disclaim any responsibility for their sub-contractors  IMG runs all our programs. We send our IMG guides from the USA, and we take full responsibility for the quality of the program. An IMG Senior Guide leads each climb, and each Guide who leads our Kilimanjaro climbs is among the best in the industry. If someone runs into trouble while on the mountain, having a fully trained and experienced Western guide at the helm will be a tremendous asset. Many accidents are avoided by having a Western guide in the lead. Radios for each guide, a satellite phone, pulse oximeter, Gamow bag and emergency oxygen are all standard equipment. But it's not the hardware as much as it is the "software." The training, skill, experience and decision making judgment of the lead guide trumps all. Safety and a successful climb come first, but we also like to have a good time and learn a few things in the process! Our IMG teams have a lot of fun traveling together. Be sure to read some of our most recent trip reports, client comments and view our Kilimanjaro blog. Why climb via the Machame Route? The trail for the Machame Route has recently been overhauled and it's nice walking now, even if we get some rain. Improved drainage has eliminated the deep mud issues of the past. And, the Machame Route takes us beneath some of Kilimanjaro's most spectacular scenery. Each camp is unique and one of our favorites is the camp at Barranco where you have a spectacular view starring up at the Western Breech. The following morning the team will enjoy a fun climb of the Barranco Wall. Because we take a full 7 days for the climb, people have a very reasonable acclimatization program. Distinctive to IMG's program is the added day/night to the Machame Route itinerary (7 days up and down), with a night at Karanga camp. A lot of teams will skip Karanga and go all the way from Barranco to Barafu (the high camp). That is a long day and you get to the high camp more fatigued. We stop the night before at Karanga in order to break that distance into two very manageable days. This results in a short walk to Barafu and our teams normally arrive before lunch time. They then have a full afternoon to rest, eat, hydrate, and just relax. We'll then have dinner and sleep until about 11pm. 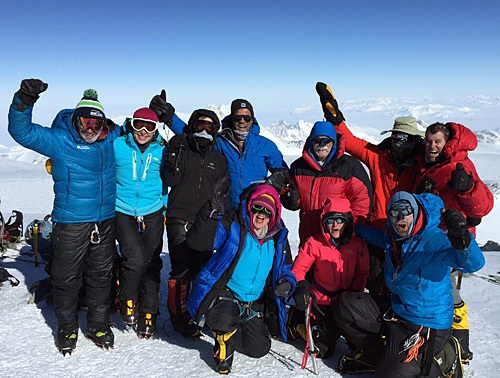 The cumulative effect is a long rest period before departing for the summit (about midnight). It makes summit day much more enjoyable to be well rested and increases our team's summit success rates. We hear that the Lemosho route is the most popular. Why choose the Machame? You've likely heard many other companies touting the benefits of climbing via the Lemosho. We've noticed this increased interest in inquiries for the Lemosho route as well. International Mountain Guides doesn't see the added day on the mountain as a "value add" to the climber. Basically the Lemosho adds an extra night on the Shira Plateau that doesn't noticeably increase acclimatization, nor does it offer opportunities for unique vistas or trekking terrain. After the extra night on the Shira Plateau, the Machame and Lemosho merge and use the same camps, so the standard ascent up the Machame makes the most sense for our climbers. Our take on the new-found popularity of the Lemosho is that adding yet another extra day (beyond seven days) is just that, extra. Why not shorten the summit day and camp in the Crater? Crater camp? Not for us. Camping at almost 19,000 ft is tough. It's cold and headaches/restless sleep are the norm. Much better to get up and get down before too much trouble can occur. Remember the old climber's adage, "climb high, sleep low." It's still true. There have been many deaths on Kili from altitude problems. We have spent way too many hours assisting climbers down from other teams who contracted edema problems while sleeping in the Crater. We will normally climb the Machame Route. The Kilimanjaro National Park staff has done a lot of work in recent years on this trail (it is now much better drained, so less muddy than in the past). The camps have also been improved, and there are Park rangers stationed at the camps to ensure that porters are not overloaded and that rubbish is removed. There is also emergency rescue available (by jeep) from the second camp (Shira Plateau). Please keep in mind that Kili is very physically demanding. The group equipment and most of our personal equipment will be carried by our Chagga porters. Our Chagga staff will also take care of the cooking chores. The Machame Route takes us past some of Kilimanjaro's most spectacular scenery and keeps us away from the crowds on the normal route. Since we have a large difference in altitude between the start of the climb and the summit, we get the opportunity to go through many vegetation zones. We will descend via the Mweka Route. This is the descent route required by Kilimanjaro National Park. We have also led climbs via the Lemosho and Western Breach Routes for special groups. If you have a private group (upwards of 8+ for best rates), please contact us for a custom quote. Who'll be leading my climb? Your climb will be led by an IMG Senior Guide, assisted by a registered African Guide and 3-5 additional assistant African guides. We also employ a chief cook, several assistant cooks, tent porters (responsible for pitching the tents), servers (responsible for meal service), and many porters to carry it all. How fast do your trips fill up, and when should we be reserving a space for trips in the second half of the year? It's hard to provide a firm answer to that question. Different trips fill up at different speeds. Sometimes a group of folks will show up at once and fill the rest of a climb. A good rule of thumb is to commit as soon as you reasonably can. Not only does it ensure your spot on the climb, it is very satisfying to write this in pen on your schedule. The earlier you sign up the earlier you will be able to enjoy the anticipation! How much climbing experience do I need? No previous climbing experience or technical climbing skills are required. The hiking is on rough trail. A small amount of snow may be encountered below the summit but it does not necessitate the use of crampons or an ice ax. Trekking or ski poles can be very useful. Some very short and relatively easy sections of rock scrambling are also encountered, requiring "using of your hands" in a couple places. Good conditioning is the primary requirement for the climb of Kilimanjaro. This is a strenuous trip. Participants must be in sound "hiking shape" and capable of traveling for a full day with a modest pack (clothing, lunch, water, camera, etc). Don't underestimate this mountain. We're going high and the summit day is long. Follow a conditioning program that will strengthen your lungs, legs and heart. Any hiking you can do before the trip will be of the most value. At home, we recommend stair climbing, bike riding and running hills. Conditioning is a process that should continue throughout the year. The equipment list is meant to help you compile your personal gear for a high altitude trekking trip. You'll notice that the gear is essentially the same as that required for a summer ascent of Rainier without the inclusion of any technical climbing gear. Most items are required, while a few are optional. Please consider each item carefully and be sure you understand the function of each piece of equipment before you substitute or delete items from your duffle. Keep in mind that this list has been carefully compiled by Phil Ershler and Eric Simonson, the expedition organizers. Don't cut corners on the quality of your gear. How big should my trekking backpack be? Here's the conservative answer. We ask that you bring a pack that is roughly 50 L as most people need a pack that size. Some people can get away with a smaller pack, but that's not the norm. On summit day, you don't want to be struggling with pulling layers out of a bulging pack and have the rest of your gear fly out with it (that happens!) We don't want to see you with a huge expedition size pack either, because then you might be tempted to fill it. Stick with 50 L and you'll be on par. Do you provide trekking poles? You can rent trekking/ski poles from the hotel in Moshi, but we highly recommend bringing all of your own equipment. Can I use a hydration system? You can use a water bladder hydration system on all days but summit day. Even when climbers blow the water out of the tube and have it in an insulated sleeve, the tubes ALWAYS freeze on summit day! We've seen folks try everything in the book, and it always ends badly! You need two (or 3 if you are a super heavy drinker) WIDE mouth water bottles in insulated covers for summit day. Should I bring a UV Pen for water purification? It's a nice thought to keep your drinking water chemical free, but these are battery powered devices that will (at some point) fail and leave you "high and dry." If you opt to bring one, make sure to bring something like Potable Aqua as a backup! Our recommendation is to use Potable Aqua with the P.A. Plus neutralizing tablets. They work really well and only take 30 minutes. How long are the tents we will be using? I am 6'4" and want to be sure my sleeping pad of 77" will fit. You'll fit in the tent just fine. I have a 15° sleeping bag. Do you think it will be sufficient for the higher-altitude Kili camps, or should I get a lower-temp-rated bag. We recommend a 10° bag, but some like to bring slightly warmer bags. It can be nice to have a little "extra cushion" so to speak. That being said, there are many things you can do to extend the range of your bag. If you are a sound sleeper, you can put your down parka over your bag. The guides do that quite often when temperatures dip. Also keep in mind that a properly inflated thermarest will insulate you from the ground very well. That goes a long way to keep you warm. You could also bring an insulated liner. If it fits well into your other bag, you'd be very well set. If the fit is too tight you'll lose the loft that creates warmth. Of course all this advice applies differently to different individuals. Do you get cold easily??? Do any of the camp sites have some sort of power or battery source to charge camera batteries? You need to bring enough camera batteries for the whole seven days of climbing. Don't count on having any charging opportunities on the climb. You will have an opportunity to recharge your batteries at the hotel before beginning safari. What kind of electrical adapter should I bring? Tanzania uses a 220-240V system, and requires a 3-prong adapter. Purchase an international travel plug adapter kit. D & G are the plug types for Tanzania. Know whether your electrical device requires a transformer or voltage converter or nothing at all (most laptops and other multi-voltage appliances). What is the situation for cell phones and internet in Tanzania? What kind of camera equipment do you recommend? A small camera is perfect for the climb. While on safari, the longer the lens the better (bring some fast film for low light conditions.) A pair of binoculars is great for the safari, too. Sometimes it's more fun to just watch the animals than try to take pictures. On safari you will be standing up in the back of the "pop top" vehicles, leaning against the roof. In this situation, serious photographers will find that a sandbag type stabilizer is much more useful than a tripod. What should I pack for the safari? Casual, loose, cool and comfortable clothes are perfect. You will get hot and dusty. Cotton is OK. Our safari camps are deluxe, so leave your "mountain" clothes behind. We don't have much time to do laundry between the climb and safari so bring enough clothes for both. You'll be amazed at the quality of accommodations while on safari. A light jacket or sweater can come in handy during the evenings. Our longtime African outfitters use 4WD "pop top" vans for the safari that allow participants to stand up for viewing and photography and the drivers do a great job of finding the critters for some world-class game viewing. For the airport transfers, our local operators use a bus. Seat belt use is uncommon in Africa, and they are not available on these vehicles. What is the situation regarding personal hygiene and daily cleanup. Do we get water for washing, shaving, etc? Warm washing water will be made available at each camp. It consists of a five gallon jug of warm water, and a small personal wash basin. Some people use this for shaving or bring electric razors. Of course you can always grow a beard! Do you take a portable toilet? On the climb we provide a toilet tent with a western style toilet seat. This is for IMG clients only. What is the policy on Leave No Trace? IMG is committed to Leave No Trace. On Kili this means working with the Kilimanjaro National Park staff to ensure that the Park regulations are followed. Garbage is carried down from the climb and turned into the Park Rangers, per the regulations. A private toilet tent as well as the Park Service maintained pit toilets are used at the camps to ensure that human waste is disposed of correctly. The toilet tent is for IMG clients only. January and February and mid-June through mid of October are normally very stable weather periods. That said, it is always difficult to predict the exact weather conditions we will encounter during our ascent. Warm rain can occur down low and we can experience cold and windy conditions higher on the mountain any time of the year. It is not unusual for the temperatures to be well below freezing on summit day before the sun comes up. A down jacket (or equivalent) is required. We expect that the weather will be perfectly reasonable but it is important to prepare for all possibilities. Safari and travel days should be comfortably warm and the evenings may require a light sweater or jacket. Because Tanzania lies below the equator, the coolest months occur during the northern hemisphere's summer, and all-year round the weather remains pleasant and comfortable. Between June to October, temperatures range from around 10°C in the northern highlands to about 23°C on the coast. On the plains and the lower-altitude game reserves, the temperatures from June to October are warm and mild. On the coast, these months are some of the most pleasant to visit, with balmy, sunny weather much of the day and cooling ocean breezes at night. From December to March, the days are hot and sunny with often not a cloud in the sky. Temperatures range from the mid-twenties to the low thirties throughout the country while visitors flock to the parks and beaches to escape the dreariness of late winter in colder climes. Clear sunny days are the norm in the northern highlands and the heat of mid-day is tempered by the golden light in late afternoon and the especially striking sunsets. In the game parks and central plains, the beautiful weather provides perfect opportunities for unhampered game viewing, and clear night skies offer perfect opportunities for star-gazing and romantic evenings in the bush. On the shores of the Swahili Coast, the Indian Ocean reaches its highest temperatures and is ideal for swimming at any time of day or night. Tanzania's equatorial climate brings two seasons of rain each year: the masika, or long rains that fall from mid-March to the end of May, and the mvuli, or short rains, that come intermittently throughout November and parts of December, and sometimes stretch into early January. During the long rains, heavy showers fall in the early mornings but usually clear up by mid-day, with the weather often remaining clear and sunny until late afternoon. By evening, impressive cloud formations build, breaking sometime after dark and the rain often continues throughout the night. During the short rains, light showers in the mornings and late afternoons are punctuated by stretches of clear weather and beautiful rays of sunlight. The beginning of both rainy seasons is marked by a change in the winds which historically, marked the time for trading boats to set off on expeditions across the Indian Ocean or return to their native lands. What can I expect to eat while on the mountain? Our cook staff does a great job of preparing meals for our teams that provide the calories necessary to make it to the summit. Meal plans will vary, but typically you can expect to enjoy a breakfast of a combination of steaming porridge, eggs, toast with all the fixings, local fruits, as well as plenty of coffee and tea. Your packed lunch each day will be a variety of carbohydrates such as sandwiches, crackers and cookies. Included in lunch will also be a boiled egg or fried chicken in addition to juice and fresh fruit. Again, you'll want to bring some extra snacks that you particularly enjoy to supplement your lunch and the long summit day. At dinnertime, you'll be happy to be warmed up with some hot soup followed by a main course of chicken, beef or fish paired with a hearty starch (think french fries, potatoes, rice, etc) and usually some vegetables and fruits. A vegetarian main dish is usually prepared as well. And before you head off to bed, you'll be able to warm up with some hot drinks in your full belly. We can accommodate most dietary restrictions, but if you have a very limited diet, please plan to bring additional foods that you can eat to supplement your special needs. If you have questions, please ask. All meals on the climb and during our safari are included. You will be responsible for your bottled drinks and alcoholic beverages. You may want to bring powdered drink mixes for flavor in your water bottles. We recommend you bring a modest personal stash of your favorite trail and snack foods (nuts, candy bars, granola bars, salami, etc.) primarily for summit day and also to supplement the lunches provided by our African staff on the climb. The Chagga cooks prepare meals using local food and the quantity and quality are excellent. When hiking, there is not a midday "lunch" stop. Instead, we will stop to eat a small snack (part of your lunch) every hour or hour and a half. Bring some snack and lunch food to supplement the trail lunches you will receive each day. A typical trail lunch may include a combination of the following: hardboiled egg, piece of fried chicken, small sandwich, cookies or biscuits, banana or orange, handful of nuts, juice box. If you anticipate not liking some of these items, you should bring more than the suggested amount of snack food to compensate. Choosing a variety of snacks is important  sweet, salty, chewy, crunchy. Many things do not taste as good at altitude. We've found that you'll be happiest with REAL food over energy bars. Anything that has lots of calories, tastes good and is easy to eat. Some snack/lunch food suggestions to bring from home are: Snickers or other candy bars, cookies, crackers, pretzels, pop tarts, cheese, summer sausage, trail mix/GORP, nuts, dried fruit, beef jerky, granola bars, packaged tuna, individual peanut butter packets, and chewy candy. Energy bars and Gu are good, but make sure they are appetizing to you and compliment them with other items  don't bring all energy bars. Drink mixes with electrolytes are also nice to add to water. Plan to bring about 2400 calories, which might weigh out to about 3 lbs of food. It is always better to show up with too much food, than not enough. Will utensils/plates/cups/mugs be provided or do we need to supply our own? The porters, cooks and servers will set up a dining tent at every camp, complete with chairs, tables, lanterns, utensils, the whole nine yards. So, you don't need to bring any of that. Will water be provided at breaking points during the day so we can refill our water bottles? Bring 2 one-liter water bottles. If you drink more water than the average person, you could bring 3, but at some point you reach a point of diminishing return. There will be virtually unlimited hot drinks at camp in the morning and when you arrive at camp. You can handle much of your hydration at that time. What kind of visas do I need? Your passport must be valid for 6 months after the trip and have empty pages available for stamps from the local authorities. Advanced visas are not required for entry into Tanzania. It is easy to purchase your visa on arrival at the JRO airport in Tanzania for US $100 (cash). Our program itineraries are built around the daily direct flights from Amsterdam into Kilimanjaro International Airport (JRO) on Delta/KLM which many of our customers utilize. We will meet the group arriving on the Delta/KLM flight at the arrival gate at Kilimanjaro International Airport, and drop the group off on the last day in time to check in for the Delta/KLM flight back to Amsterdam. The transfers to/from JRO in conjunction with the Delta/KLM flights are included in the trip price. On days with two KLM flights from AMS to JRO, this would be the earlier flight. If you are arriving on a different flight, please let us know so we can arrange a pickup and transfer to the hotel (at your expense, normally about $70). Flights into Kilimanjaro can be in short supply during the popular climbing seasons, so it is very important to book your air reservations early. Lost luggage is a pain, so make sure that your flight connections aren't too tight and try to keep the number of connections to a minimum. When you are making travel plans, use the same airline or their partners as much as possible. Please ask for Pirjo, who works directly with our programs. What if an East Coast storm delays my flight? We all know how air travel on the East Coast can shut down in the winter time due to heavy storms, and we have a few thoughts for our customers traveling from the East to join our December-February trips. You may want to consider departing a day earlier than necessary in order to hopefully mitigate the effects of a bad storm that prevents your trip from departing on time. If you choose to depart a day earlier, you may consider spending your extra day in Amsterdam seeing the sights (assuming that is your connecting flight), or you may arrive JRO early and we'll be happy to assist you with your early arrival. Regardless of whether or not you choose to leave your home city early, we always recommend the purchase of adequate travel insurance. Please review our travel insurance suggestions online here: Trip Cancellation and Travel Insurance. What's the best way to pack for the trip? We usually carry a daypack/rucksack as carry-on luggage and check two lockable bags. One of those bags can stay at the hotel while climbing for storage of your travel clothes (it is OK to leave a bag with wheels at the hotel). The other bag will be used by the porters to carry your gear on the climb, and it should NOT have wheels. It does not have to be 100% waterproof, just stout nylon fabric is fine. You will want to put everything in plastic bags anyway, inside the duffel. We limit this porter bag to 30 pounds maximum per climber. Most climbers find the 30 lb. allowance to be quite reasonable for a climb of Kilimanjaro. The welfare of the IMG porter team is of prime importance, and your bag will be weighed prior to the beginning of the climb to be in compliance with Kilimanjaro National Park porter regulations. Climbers who feel they absolutely need more than the 30 lb. allowance will be charged an additional fee to cover the increased porter requirements. Additionally, we suggest that you use a travel wallet that you can hang around your neck and place inside your shirt. This is a safer way to carry your money and travel documents. Leave expensive jewelry and watches at home. Experienced travelers will also carry a couple of extra passport photos with them as well as a photocopy of the first pages of your passport. These should be carried in a place separate from your passport. Having these available will greatly facilitate the replacement of your passport if you lose it. Carry a pen with you for completing travel forms. Get to the airport early and make sure your luggage gets checked through to the correct destination. Does the hotel have a safe where I can store items while on the mountain? I know to lock my extra duffle, but what are my options for storing a camera or laptop? We recommend that any valuables like cameras or laptops are checked in with our main contact at the Keys Hotel. The rest of the luggage will be kept together at the hotel, but anything more valuable we ask that you give to our contact who will give you a receipt for the item. Your guide can help you to get this settled when you are there in Moshi. Can our luggage that we are leaving at the hotel during the hike have wheels on it or does this also need to be a duffel without wheels? The luggage you leave at the hotel can have wheels. Don't take the wheeled bag on safari either though. Space for luggage on safari can be tight. There is plenty of room, it's just not usually "luggage" shaped! What are the local concerns and responsibilities? We take great pride in the long term relationships we have built with our local staff. They do a great job, we pay and tip them well, and they enjoy working for IMG. We make sure that the IMG porters have adequate clothing, equipment, shelter, sleeping arrangements, food, cooking equipment and water. Sick or injured porters are properly cared for. All loads are weighed to ensure that porters are carrying loads that don't exceed their physical ability or legal limits. Porters are paid a fair wage for their work and are paid tip money directly from the tip pool at the end of the expedition (no middleman taking a cut). 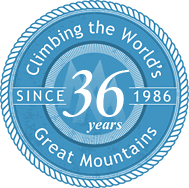 We encourage our team members to observe and participate in the staff tipping session at the end of the climb and suggest a contribution of $250 per member. How much should I plan for tips and gifts? We recommend $250 for the group tip pool. For spending money, it all depends on how much you drink and how many gifts you purchase. Another $500 should be plenty. Nice shops will accept credit cards but normally charge a 3-5% service fee. Be sure to notify your credit card company that you are traveling internationally before you leave home so it is less likely that your card will be "flagged and frozen." Will we have an opportunity to exchange money into local currency before we need to tip the porters? You can change money at airport upon arrival, or on your visit to the local town of Moshi. The lead IMG Guide will handle the tipping to the porters with the money that you and the team put in the tip pool. It can be nice to have a few US singles in your pocket for tipping the occasional bag handler. Will we be able to go back to the hotel where our 2nd bag is being stored before we need to tip the porters so we could leave gifts/money there instead of carrying them with us on the mountain? We will say goodbye to the porters at the Mweka Gate after the climb. The team leader will also pay the tips (from the tip pool) to everyone at this time. If you wish to donate some of your used gear to the porters after the climb, you can add these items a collection bag we will pass around at the Mweka Gate. We feel it is preferable to donate items directly to the porters, rather than through some middleman. If you have a large amount of give-away items, we can have a bag sent up from the hotel with the jeep driver on the morning the team returns to Mweka Gate. Again, we will say goodbye to most of the Chagga staff here. Yellow Fever: Currently not required if you are traveling directly to Tanzania from a non-endemic area (like the USA or Europe), but it IS required by Tanzania IF you are coming via an endemic area (including China). In this case bring your shot record. Recommended if you are traveling to some other parts of Tanzania with more risk (like Zanzibar). Meningitis: Ask your physician/travel clinic for advice. Hepatitis A and B: Recommended. Ask your physician/travel clinic for advice. Rabies and Typhoid: Good to be on the safe side, the new vaccines are easy. What other medical info should I consider? While it's always nice to have a doctor as a participant on our trips, we cannot guarantee a doctor's presence. We ask that you carefully complete the Medical Information form included in the registration materials. We need to be informed of any allergies you may have, medicines you are currently taking and any medical conditions that could possibly effect your ability to safely participate on a climbing expedition. In addition to the first aid items listed on the equipment list, there are a few additional medications that you should consider. These should be discussed with your personal physician and some will require a prescription. We want everyone to bring some of the antibiotic azithromycin ("Z-Pak") and some Immodium in case of bad traveler's diarrhea. Please consider both of these medications as part of your REQUIRED equipment list. A sleeping medication can be useful for napping on the international flights and for the first few days in Africa (due to the big time change). We do not recommend the automatic use of Diamox while climbing but you might find a small dose (125mg) useful if altitude sickness symptoms appear. Discuss this and your other medication requirements with your physician. Any medication should be used only if necessary and use should be discussed thoroughly with your physician and with your guide before you take the medication. Water purification is also very important. An effective and inexpensive method is the use of iodine crystals or tablets. These are available commercially at mountaineering stores as a product called 'Polar Pure' or 'Potable Agua'. Filters, such as the ones made by MSR, are also good. Either can be used or both can be used in combination. Bottled water is also readily available while on safari. We also recommend that each participant bring a small bottle of a hand disinfectant such as Purell. Finally, don't forget to take care of any lurking dental problems. Nothing wrecks a trip faster than a toothache! Anything that we can do to stay healthy is worthwhile. Health issues will be discussed during the expedition and we encourage you to contact us if you have any questions before or during the trip. Do I really need to bring the high altitude medications Nifedipine and Dexamethasome? Our IMG guides are very experienced with dealing with altitude illness, but we are not allowed to provide prescription drugs to our customers. For this reason we ask each climber to consult with their own physician and to bring their own emergency medications to use (while descending!) in case of onset of high altitude pulmonary or cerebral edema symptoms. These include Nifedipine and Dexamethasome, which will help to "buy some time" to get down to a lower altitude. The Nifedipine is useful for pulmonary edema (take one 30mg sustained release tablet every twelve hours) and the Dexamethasome is useful for cerebral edema (take one 4mg tablet every 6 hours). Our suggestion is that climbers each bring a few tablets of each medication (2 tabs of Nifedipine and 4 tabs of Dex is plenty) and that should be sufficient to provide one day of treatment so the patient can get down, if they start to get sick. For more information see this recent article in WILDERNESS & ENVIRONMENTAL MEDICINE, 21, 146-155 (2010). You note that we should bring sleeping pills to help overcome jet lag, but won't that make us groggy getting up on the mountain? First, there is no reason to take sleeping pills if you don't have to, and not sleeping well is not going to be a life threatening emergency. However, for some people the 12 hour time change going to Africa just gets them really all messed up... to the point that they are not feeling well. If you have available (for use if necessary) some short acting sleeping pills (like Ambien) for the first few nights it can help get you back on track. The short acting ones like Ambien don't make you particularly groggy. Also they are good for sleeping on the airplane so remember to bring earplugs and eyeshade for that too. Similarly up on the mountain a lot of people find that taking a Diamox (125mg is plenty) before bedtime can also help a lot with falling asleep. Especially at higher altitude. Speak with your doctor, but you might give that a try if you found that your sleep was not so good above 9000 feet in the past. There is a good chance that there was a component of AMS involved, and the Diamox can help with that. Can I wear contacts in the mountains? Getting your eyewear system down is super important for a climb like Kili. Here are a few ideas to think over and then choose what works best for your specific needs. Contact lens wearers can certainly wear their contacts while on Kilimanjaro. A good lens cleaning routine is essential. You'll also need to make sure that your solution stays warm and doesn't freeze. Keeping it near your body as the temperatures drop works well. You'll also want to be sure to bring prescription glasses as a back-up and goggles in case the winds start blowing a lot of dust. We've had some customers decide to get one-a-day disposable contact lenses, and that works for many people too. Just be sure to bring a mirror! Because you'll need to have a pair of sunglasses that (preferably) provide tight coverage around your eyes, the dilemma of contacts vs. glasses becomes an issue for some. For those people who wear glasses, but can't wear contacts, you may want to consider a pair of prescription sport/glacier glasses. If you see yourself doing a lot of climbing, it is probably worth the investment; it sure beats trying to wear goggles and glasses at the same time. www.opticus.com is a good place to get a pair  not a cheap solution (~$300) but worth their weight in gold when compared to the alternative. It is always possible, though, probably not super comfortable, for someone to wear normal glasses under a pair of dark goggles with proper UV protection, but is not recommended unless this is a system you have employed on previous backpacking/climbing trips. You'll likely feel a bit uncomfortable hiking for hours in the sun with a hot ski mask on. The goggles are great for when the wind picks up, but otherwise, probably not ideal as an alternative to "sunglasses." Whichever route you go, just make sure you have a backup (or two). It is too easy to crunch a set of glasses or tear your contacts on the mountain! What happens if I need to "turn around" on the mountain? We've led a couple hundred Kili trips and more than half the time we get everyone to the top. Still, it is not unusual that somebody in the group starts to have a problem at some point along the way. 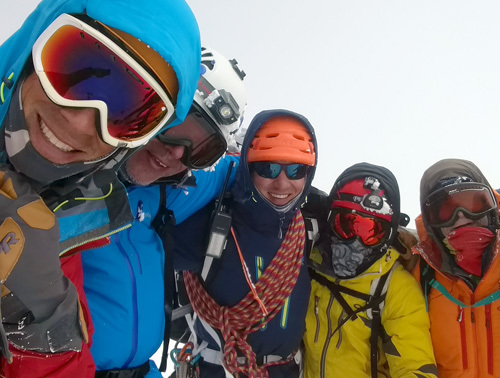 The general perception is that issues only occur on the summit day, but in fact people can have health or altitude issues at any point on the trip. So, there are multiple bail-out points along the way. Depending on where the climbers are, they can either go back down to Machame gate (from the first camp), take the rescue jeep from Shira via the road to the west (from the second camp), descend Umbwe Route from Barranco camp, or traverse to Mweka from Karanga camp. If someone bails out along the way, we send one of our guides (and a porter for their duffel) down with them (or if via the rescue jeep from Shira, they go with park rangers). If someone starts to falter on the summit day, en route to the top, the first thing we do is take their backpack and have it carried for them. Often this is enough to allow them to continue the climb. If, after taking their pack they are still unable keep moving (or if they are getting altitude sickness), then we turn them around with one of our guides. We carry 4 VHF radios with the team. 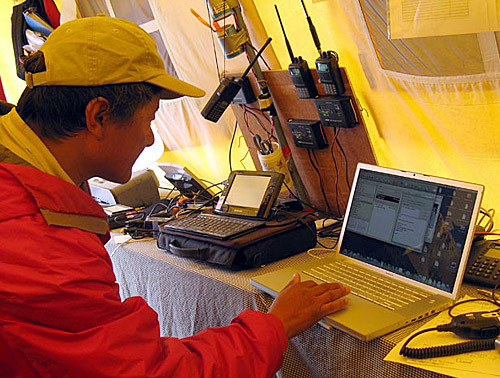 That enables us to send a radio with the descending team so we can stay in touch with them. Once they get back down to Barafu Camp, if the climber is feeling much better they have the option of waiting there for the rest of the climbers to descend. But, if they still feel bad upon descent to Barafu, then we have them continue descending to Mweka where they meet up with the summit team later in the day. We have multiple guides with us, so if we have to send down more than one climber (from different places), that is not an issue. What happens if I get sick or injured on the climb or safari? As part of our efforts to set up the best possible evacuation services in the event of illness or accident, we want to make sure you clearly understand what is (and is not) available in Tanzania. Please read carefully and note that certain services require that you provide IMG with your insurance information. For rescue during the CLIMB, we pay a rescue fee to the Kilimanjaro National Park. There are wheeled litters on the mountain available for evacuations of people who cannot walk, and the Kili Park Rangers will assist with an emergency evacuation using the wheeled litter. Helicopter evacuation service is generally NOT available on Kilimanjaro. 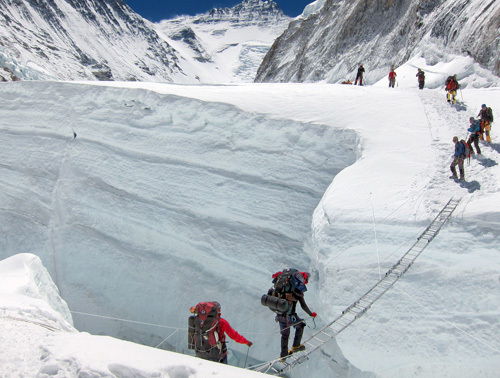 For altitude sickness, descent is normally the best option. From Machame Camp, people will hike back down to Machame Gate. From Shira Camp, we can usually get a jeep to drive people down via the jeep road to the west, across Shira Plateau (this is where people often bail out if they are having altitude problems). If people need to descend from Barranco Camp, they will descend the Umbwe Route to the Umbwe Gate. If people get sick at Karanga Camp (or higher) they will descend Mweka Route to Mweka Gate. Persons going down will be assisted by our Chagga staff. When people get down to the base of the mountain, we will arrange for transport to our Hotel in Moshi, where normally they hang out and recover and wait for the team to come down. The Hotel in Moshi has a physician on call, so if people need to go to the doctor (or hospital) that is not a problem to arrange (the KCMC hospital is just a few minutes away from the Hotel). If you do not currently have an insurance policy that provides you with air ambulance coverage and would like to purchase a policy, please visit our Travel Insurance page for a recommendation on travel insurance that includes air ambulance/evacuation coverage. If you have questions, we're here to assist.